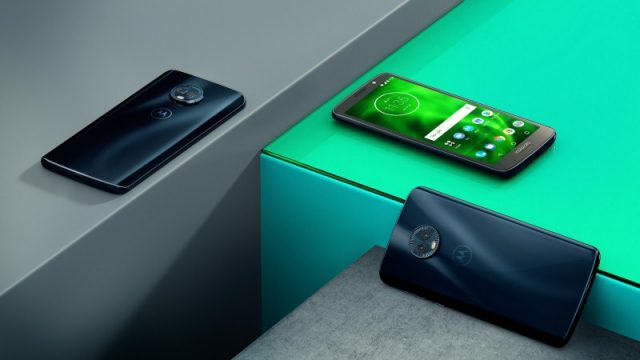 Australia will be getting its hands on a new line-up of appealing mid-range smartphones from Motorola this week, with the launch of its Moto G6 and E5 brands. Following on from the success of last year's Moto G5 and E4 handsets, the new phones are designed to combine capable performance with winning value, with all four of the devices set to be available via JB Hi-Fi, Officeworks, Harvey Norman and The Good Guys from June 7th. The standard-bearer for the new line-up is the Moto G6, which will be priced at $399 in Australia. The device features an eye-catching 5.7-inch Full HD Max Vision display, a 3D glass back and dual rear 5MP and 12MP cameras, with performance powered by a Snapdragon 450 processor, 3GB of RAM, 32GB of on-board storage and a 3000mAh battery. For a lower-priced option, users can opt instead for the Moto G6 Play, which retails for $329. The specs are slightly lower, with its 13MP single-lens rear camera and Snapdragon 430 processor, but it shares many of its key attributes with the standard Moto G6, and its 4000mAh battery can last up to 36 hours on a single charge. Motorola is also catering for those seeking a more premium option with the $499 Moto G6 Plus, which expands the Moto G6 experience with its vivid 5.9-inch 18:9 display, and boasts enhanced horsepower thanks to its Snapdragon 630 processor, 4GB of RAM, 64GB of on-board storage and 3200mAh battery. Finally, for the most cost-effective choice, the Moto E5 will be sold for $229. Its Snapdragon 425 processor, 2GB of RAM, 16GB of storage and a 4000mAh battery means it packs a lot of punch at a low price point, as well as offering great looks with its 5.7-inch display.